Growing to a little less than 1m in height and spreading over 1.5m it flowers from spring through to summer, pretty mauve / purple flowers, with a slight vanilla scent. The foliage is deep green and slightly ribbed. The perfumed flowers are used in potpourri as well as commercially in soap. The vanilla fragrance fills the air on a warm summers day and these are a plant that bees and butterflies seem to love. A warm sunny position is best, protection from heavy frosts is essential, and a humus rich moist soil is best. Although Heliotrope can not be really classed as a water wise plant it does cope well through summers in a humus rich soil as long as it given protection from hot afternoon sun. These are an evergreen species easily grown from seed. Textured foliage is attractive and these low growing spreading plants are often best suited to part shade in Australian conditions where the hot dry summers tend to be a little harsh at times. 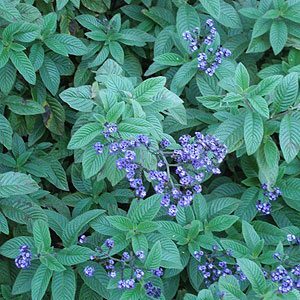 Regular light pruning will keep Heliotrope, as it is known from becoming to straggly. A little general purpose fertiliser in spring, and some mulch to maintain moisture and keep a cool root run, and this is really an easy care plant. Heliotropium arborescens ‘White Lady’ has white flowers as the name suggests. Heliotropium arborescens ‘Lord Roberts’ has slightly deeper purple flowers than the species. Heliotropium arborescens ‘Marine’ is another with darker flowers. Heliotropium arborescens ‘Aurea’ has lighter, yellow green foliage, if you can find it. Heliotropium arborescens ‘Plum Pie’ is a more compact variety with purple flowers. Heliotrope are available fro sale from the following nurseries.